A monarchy is a form of government in which a single person holds supreme authority in ruling a country, also performing ceremonial duties and embodying the country's national identity. Although some monarchs are elected, in most cases, the monarch's position is inherited and lasts until death or abdication. In these cases, the royal family or members of the dynasty usually serve in official capacities as well. The governing power of the monarch may vary from purely symbolic (crowned republic), to partial and restricted (constitutional monarchy), to completely autocratic (absolute monarchy). Monarchy was the most common form of government until the 20th century. Forty-five sovereign nations in the world have monarchs acting as heads of state, sixteen of which are Commonwealth realms that recognise Queen Elizabeth II as their head of state. Most modern monarchs are constitutional monarchs, who retain a unique legal and ceremonial role, but exercise limited or no political power under the nation's constitution. In some nations, however, such as Brunei, Morocco, Oman, Qatar, Saudi Arabia, and Eswatini, the hereditary monarch has more political influence than any other single source of authority in the nation, either by tradition or by a constitutional mandate. The word "monarch" (Latin: monarcha) comes from the Greek language word μονάρχης, monárkhēs (from μόνος monos, "one, singular", and ἄρχω árkhō, "to rule" (compare ἄρχων arkhon, "leader, ruler, chief")) which referred to a single, at least nominally absolute ruler. In current usage the word monarchy usually refers to a traditional system of hereditary rule, as elective monarchies are quite rare. The form of societal hierarchy known as chiefdom or tribal kingship is prehistoric. The Greek term monarchia is classical, used by Herodotus (3.82). The monarch in classical antiquity is often identified as "king" or "ruler" (translating archon, basileus, rex, tyrannos etc.) or as "queen" (Greek: basilinna). From earliest historical times, with the Egyptian and Mesopotamian monarchs, as well as in reconstructed Proto-Indo-European religion, the king held sacral functions directly connected to sacrifice, or was considered by their people to have divine ancestry. The role of the Roman emperor as the protector of Christianity was conflated with the sacral aspects held by the Germanic kings to create the notion of the "divine right of kings" in the Christian Middle Ages. The Chinese, Japanese and Nepalese monarchs continued to be considered living Gods into the modern period. Since antiquity, monarchy has contrasted with forms of democracy, where executive power is wielded by assemblies of free citizens. In antiquity, some monarchies were abolished in favour of such assemblies in Rome (Roman Republic, 509 BC), and Athens (Athenian democracy, 500 BC). In Germanic antiquity, kingship was primarily a sacral function, and the king was directly hereditary for some tribes, while for others he was elected from among eligible members of royal families by the thing. The modern resurgence of parliamentarism and anti-monarchism began with the temporary overthrow of the English monarchy by the Parliament of England in 1649, followed by the American Revolution of 1776 and the French Revolution of 1789. One of many opponents of that trend was Elizabeth Dawbarn, whose anonymous Dialogue between Clara Neville and Louisa Mills, on Loyalty (1794) features "silly Louisa, who admires liberty, Tom Paine and the USA, [who is] lectured by Clara on God's approval of monarchy" and on the influence women can exert on men. Much of 19th-century politics featured a division between anti-monarchist Radicalism and monarchist Conservativism. Many countries abolished the monarchy in the 20th century and became republics, especially in the wake of either World War I, World War II, the Palestine War, or the Cold War. Advocacy of republics is called republicanism, while advocacy of monarchies is called monarchism. In the modern era, monarchies are more prevalent in small states than in large ones. Monarchies are associated with political or sociocultural hereditary reign, in which monarchs reign for life (although some monarchs do not hold lifetime positions: for example, the Yang di-Pertuan Agong of Malaysia serves a five-year term) and the responsibilities and power of the position pass to their child or another member of their family when they die. Most monarchs, both historically and in the modern day, have been born and brought up within a royal family, the centre of the royal household and court. Growing up in a royal family (called a dynasty when it continues for several generations), future monarchs are often trained for their expected future responsibilities as monarch. Different systems of succession have been used, such as proximity of blood, primogeniture, and agnatic seniority (Salic law). While most monarchs have been male, many female monarchs also have reigned in history; the term queen regnant refers to a ruling monarch, while a queen consort refers to the wife of a reigning king. Rule may be hereditary in practice without being considered a monarchy: there have been some family dictatorships, and also some political families in many democracies. Some monarchies are non-hereditary. In an elective monarchy, monarchs are elected, or appointed by some body (an electoral college) for life or a defined period, but once appointed they serve as any other monarch. Four elective monarchies exist today: Cambodia, Malaysia and the United Arab Emirates are 20th-century creations, while one (the papacy) is ancient. A self-proclaimed monarchy is established when a person claims the monarchy without any historical ties to a previous dynasty. There are examples of republican leaders who have proclaimed themselves monarchs: Napoleon I of France declared himself Emperor of the French and ruled the First French Empire after having held the title of First Consul of the French Republic for five years after he seized power in the coup of 18 Brumaire. President Jean-Bédel Bokassa of the Central African Republic declared himself Emperor of the Central African Empire. Yuan Shikai, the first formal President of the Republic of China, crowned himself Emperor of the short-lived "Empire of China" a few years after the Republic of China was founded. King Salman of Saudi Arabia is an absolute monarch. In a constitutional monarchy, the monarch is subject to a constitution. The monarch is mainly a ceremonial figurehead symbol of national unity and state continuity. The monarch is nominally sovereign but the electorate, through their legislature, exercise political sovereignty. Constitutional monarchs' political power is limited. Typical monarchical powers include granting pardons, granting honours, and reserve powers, e.g. to dismiss the prime minister, refuse to dissolve parliament, or veto legislation ("withhold Royal Assent"). They often also have privileges of inviolability, sovereign immunity, and an official residence. A monarch's powers and influence will depend on tradition, precedent, popular opinion, and law. In other cases the monarch's power is limited, due not to constitutional restraints, but to effective military rule. In the late Roman Empire, the Praetorian Guard several times deposed Roman Emperors and installed new emperors. Similarly, in the Abbasid Caliphate the Ghilmans (slave soldiers) deposed Caliphs once they became prominent, allowing new ones to come to power. The Hellenistic kings of Macedon and of Epirus were elected by the army, which was similar in composition to the ecclesia of democracies, the council of all free citizens; military service was often linked with citizenship among the male members of the royal house. The military have dominated the monarch in modern Thailand and in medieval Japan (where a hereditary military chief, the shōgun, was the de facto ruler, although the Japanese emperor nominally reigned). In Fascist Italy the Savoy monarchy under King Victor Emmanuel III coexisted with the Fascist single-party rule of Benito Mussolini; Romania under the Iron Guard and Greece during the first months of the Colonels' regime were similar. Spain under Francisco Franco was officially a monarchy, although there was no monarch on the throne. Upon his death, Franco was succeeded as head of state by the Bourbon heir, Juan Carlos I, and Spain became a democracy with the king as a figurehead constitutional monarch. Postcard of ruling monarchs, taken in 1908 between February (accession of King Manuel II of Portugal) and November (death of Guangxu Emperor). Most states only have a single person acting as monarch at any given time, although two monarchs have ruled simultaneously in some countries, a situation known as diarchy. Historically this was the case in the ancient Greek city-state of Sparta and also in 17th-century Russia, and there are examples of joint sovereignty of spouses or relatives (such as William III and Mary II in the Kingdoms of England and Scotland). Other examples of joint sovereignty are Tsars Peter I and Ivan V of Russia, and Charles V, Holy Roman Emperor and Joanna of Castile of the Crown of Castile. Andorra currently is the world's only constitutional diarchy or co-principality. Located in the Pyrenees between Spain and France, it has two co-princes: the Bishop of Urgell in Spain (a prince-bishop) and the President of France (derived ex officio from the French kings, who themselves inherited the title from the counts of Foix). It is the only situation in which an independent country's (co-)monarch is democratically elected by the citizens of another country. In a personal union, separate independent states share the same person as monarch, but each realm retains its separate laws and government. The sixteen separate Commonwealth realms are sometimes described as being in a personal union with Queen Elizabeth II as monarch; however, they can also be described as being in a shared monarchy. Leo I the Magnificent, first king of Armenian Cilicia, Leo succeeded in establishing Cilician Armenia as a powerful and a unified Christian state with a pre-eminence in political affairs. Monarchy, especially absolute monarchy, is sometimes linked to religious aspects; many monarchs once claimed the right to rule by the will of a deity (Divine Right of Kings, Mandate of Heaven), or a special connection to a deity (sacred king), or even purported to be divine kings, or incarnations of deities themselves (imperial cult). Many European monarchs have been styled Fidei defensor (Defender of the Faith); some hold official positions relating to the state religion or established church. In the Western political tradition, a morally-based, balanced monarchy was stressed as the ideal form of government, and little attention was paid to modern-day ideals of egalitarian democracy: e.g. Saint Thomas Aquinas unapologetically declared: "Tyranny is wont to occur not less but more frequently on the basis of polyarchy [rule by many, i.e. oligarchy or democracy] than on the basis of monarchy." (On Kingship). However, Thomas Aquinas also stated that the ideal monarchical system would also have at lower levels of government both an aristocracy and elements of democracy in order to create a balance of power. The monarch would also be subject to both natural and divine law, and to the Church in matters of religion. In Dante Alighieri's De Monarchia, a spiritualised, imperial Catholic monarchy is strongly promoted according to a Ghibelline world-view in which the "royal religion of Melchizedek" is emphasised against the priestly claims of the rival papal ideology. 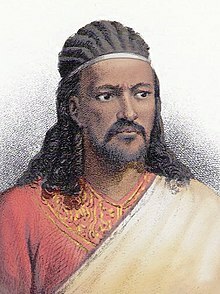 Tewodros II, Emperor of Ethiopia. Monarchs can have various titles. Common European titles of monarchs are emperor or empress (from Latin: imperator or imperatrix), king or queen, grand duke or grand duchess, prince or princess, duke or duchess (in that hierarchical order of nobility). Some early modern European titles (especially in German states) included elector (German: Kurfürst, Prince-Elector, literally "electing prince"), margrave (German: Markgraf, equivalent to the French title marquis, literally "count of the borderland"), and burgrave (German: Burggraf, literally "count of the castle"). Lesser titles include count, princely count, and imam (Use in Oman). Slavic titles include knyaz and tsar (ц︢рь) or tsaritsa (царица), a word derived from the Roman imperial title Caesar. In the Muslim world, titles of monarchs include caliph (successor to the Islamic prophet Muhammad and a leader of the entire Muslim community), padishah (emperor), sultan or sultana, shâhanshâh (emperor), shah, malik (king) or malikah (queen), emir (commander, prince) or emira (princess), sheikh or sheikha. East Asian titles of monarchs include huángdì (emperor or empress regnant), tiānzǐ (son of heaven), tennō (emperor) or josei tennō (empress regnant), wang (king) or yeowang (queen regnant), hwangje (emperor) or yeohwang (empress regnant). South Asian and South East Asian titles included mahārāja (emperor) or maharani (empress), raja (king) and rana (king) or rani (queen) and ratu (South East Asian queen). Historically, Mongolic and Turkic monarchs have used the title khan and khagan (emperor) or khatun and khanum and Ancient Egypt monarchs have used the title pharaoh for men and women. King Leopold I, an elected founder of the hereditary monarchy of Belgium. Elizabeth II and Prince Philip, Duke of Edinburgh, October 1992. 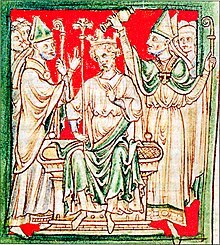 Before primogeniture was enshrined in European law and tradition, kings would often secure the succession by having their successor (usually their eldest son) crowned during their own lifetime, so for a time there would be two kings in coregency – a senior king and a junior king. Examples were Henry the Young King of England and the early Direct Capetians in France. Sultan Ali Yusuf Kenadid, heir to the Somali Sultanate of Hobyo. Sometimes, however, primogeniture can operate through the female line. In some[which?] systems a female may rule as monarch only when the male line dating back to a common ancestor is exhausted. In 1980, Sweden became the first European monarchy to declare equal (full cognatic) primogeniture, meaning that the eldest child of the monarch, whether female or male, ascends to the throne. Other kingdoms (such as the Netherlands in 1983, Norway in 1990, Belgium in 1991, Denmark and Luxembourg) have since followed suit. The United Kingdom adopted absolute (equal) primogeniture (subject to the claims of existing heirs) on April 25, 2013, following agreement by the prime ministers of the sixteen Commonwealth Realms at the 22nd Commonwealth Heads of Government Meeting. In the absence of children, the next most senior member of the collateral line (for example, a younger sibling of the previous monarch) becomes monarch. In complex cases, this can mean that there are closer blood relatives to the deceased monarch than the next in line according to primogeniture. This has often led, especially in Europe in the Middle Ages, to conflict between the principle of primogeniture and the principle of proximity of blood. Other hereditary systems of succession included tanistry, which is semi-elective and gives weight to merit and Agnatic seniority. In some monarchies, such as Saudi Arabia, succession to the throne first passes to the monarch's next eldest brother, and only after that to the monarch's children (agnatic seniority). Although this was true in the past, on June 21st, 2017 King Salman of Saudi Arabi revolted against this style of monarchy and elected his son to inherit the throne. Pope Francis, Sovereign of the Vatican City State. In an elective monarchy, monarchs are elected, or appointed by some body (an electoral college) for life or a defined period, but then reign like any other monarch. There is no popular vote involved in elective monarchies, as the elective body usually consists of a small number of eligible people. Historical examples of elective monarchy are the Holy Roman Emperors (chosen by prince-electors, but often coming from the same dynasty), and the free election of kings of the Polish–Lithuanian Commonwealth. For example, Pepin the Short (father of Charlemagne) was elected King of the Franks by an assembly of Frankish leading men; Stanisław August Poniatowski of Poland was an elected king, as was Frederick I of Denmark. Germanic peoples had elective monarchies. Five forms of elective monarchies exist today. The pope of the Roman Catholic Church (who rules as Sovereign of the Vatican City State) is elected for life by the College of Cardinals. In the Sovereign Military Order of Malta, the Prince and Grand Master is elected for life tenure by the Council Complete of State from within its members. In Malaysia, the federal king, called the Yang di-Pertuan Agong or Paramount Ruler is elected for a five-year term from among and by the hereditary rulers (mostly sultans) of nine of the federation's constitutive states, all on the Malay peninsula. The United Arab Emirates also has a procedure for electing its monarch. Furthermore, Andorra has a unique constitutional arrangement as one of its heads of state is the President of the French Republic in the form of a Co-Prince. This is the only instance in the world where the monarch of a state is elected by the citizens of a different country. Appointment by the current monarch is another system, used in Jordan. It also was used in Imperial Russia; however, it was soon changed to semi-Salic, because the instability of the appointment system resulted in an age of palace revolutions. In this system, the monarch chooses the successor, who is always his relative. Queen Elizabeth II is the monarch of sixteen Commonwealth realms (Antigua and Barbuda, the Commonwealth of Australia, the Commonwealth of the Bahamas, Barbados, Belize, Canada, Grenada, Jamaica, New Zealand, the Independent State of Papua New Guinea, the Federation of Saint Christopher and Nevis, Saint Lucia, Saint Vincent and the Grenadines, the Solomon Islands, Tuvalu and the United Kingdom of Great Britain and Northern Ireland). They have evolved out of the British Empire into fully independent states within the Commonwealth of Nations that retain the Queen as head of state, unlike other Commonwealth countries, which are either dependencies or republics, or have a different royal house. All sixteen realms are constitutional monarchies and full democracies where the Queen has limited powers or a largely ceremonial role. The Queen is head of the established Church of England in the United Kingdom, while the other 15 realms do not have an established church. The Principality of Andorra, the Kingdom of Belgium, the Kingdom of Denmark, the Grand Duchy of Luxembourg, the Kingdom of the Netherlands, the Kingdom of Norway, the Kingdom of Spain, and the Kingdom of Sweden are fully democratic states in which the monarch has a limited or largely ceremonial role. There is generally a Christian religion established as the official church in each of these countries. This is the Lutheran form of Protestantism in Norway, Sweden and Denmark, while Andorra is a Roman Catholic country. Spain, Belgium and the Netherlands have no official State religion. Luxembourg, which is very predominantly Roman Catholic, has five so-called officially recognised cults of national importance (Roman Catholicism, Protestantism, Greek Orthodoxy, Judaism and Islam), a status which gives to those religions some privileges like the payment of a state salary to their priests. the other, the bishop of Urgel, is appointed by a foreign head of state, the Pope. The Principality of Liechtenstein and the Principality of Monaco are constitutional monarchies in which the Prince retains some powers of an absolute monarch. For example, the 2003 Constitution referendum gave the Prince of Liechtenstein the power to veto any law that the Landtag (parliament) proposes and the Landtag can veto any law that the Prince tries to pass. The Prince can appoint or dismiss any elective member or government employee. However, he is not an absolute monarch, as the people can call for a referendum to end the monarch's reign. When Crown Prince Alois threatened to veto a referendum to legalize abortion in 2011 (which did not actually happen)[clarification needed], it came as a surprise because the Prince had not vetoed any law for over 30 years. The Prince of Monaco has simpler powers; he cannot appoint or dismiss any elective member or government employee to/from his or her post, but he can elect the minister of state, government council and judges. Both Albert II, Prince of Monaco and Hans-Adam II, Prince of Liechtenstein are theoretically very powerful within their small states, but in practice even they have very limited power compared to the Islamic monarchs (see below). They also own huge tracts of land and are shareholders in many companies. The Islamic monarchs of the Kingdom of Bahrain, the Nation of Brunei, The Hashemite Kingdom of Jordan, the State of Kuwait, Malaysia, the Kingdom of Morocco, the Sultanate of Oman, the State of Qatar, the Kingdom of Saudi Arabia, and the United Arab Emirates generally retain far more powers than their European or Commonwealth counterparts. Brunei, Oman, Qatar and Saudi Arabia remain absolute monarchies; Bahrain, Kuwait and United Arab Emirates are classified as mixed, meaning there are representative bodies of some kind, but the monarch retains most of his powers; Jordan, Malaysia and Morocco are constitutional monarchies, but their monarchs still retain more substantial powers than European equivalents. The Kingdom of Bhutan, the Kingdom of Cambodia, Japan and the Kingdom of Thailand are constitutional monarchies where the monarch has a limited or merely ceremonial role. Bhutan, Japan and Thailand were never colonised by European powers, but Japan and Thailand changed from traditional absolute monarchies into constitutional ones during the 20th century, and Bhutan made the change in 2008. Cambodia had its own monarchy after independence from the French Colonial Empire, but it was deposed after the Khmer Rouge came into power, with the subsequent invasion by the Socialist Republic of Vietnam. The monarchy was subsequently restored in the peace agreement of 1993. Five monarchies do not fit into any of the above groups by virtue of geography or class of monarchy: the Kingdom of Tonga in Polynesia; the Kingdom of Eswatini and the Kingdom of Lesotho in Africa; the Vatican City State and the Sovereign Military Order of Malta in Europe. Of these, Lesotho and Tonga are constitutional monarchies, while Eswatini and the Vatican City are absolute monarchies. Eswatini is unique among these monarchies, often being considered a diarchy: the King, or Ngwenyama, rules alongside his mother, the Ndlovukati, as dual heads of state; this was originally intended to provide a check on political power. The Ngwenyama, however, is considered the administrative head of state, while the Ndlovukati is considered the spiritual and national head of state, a position which more or less has become symbolic in recent years. The Pope is the absolute monarch of the Vatican City State (a separate entity from the Holy See) by virtue of his position as head of the Roman Catholic Church and Bishop of Rome; he is an elected rather than a hereditary ruler and does not have to be a citizen of the territory prior to his election by the cardinals. The Order of Malta describes itself as a "sovereign subject" based on its unique history and unusual present circumstances, but its exact status in international law is subject of debate. The ruling Kim family in North Korea (Kim Il-sung, Kim Jong-il and Kim Jong-un) has been described as a de facto absolute monarchy or a "hereditary dictatorship". In 2013, Clause 2 of Article 10 of the new edited Ten Fundamental Principles of the Korean Workers' Party states that the party and revolution must be carried "eternally" by the "Baekdu (Kim's) bloodline". ^ The Feminist Companion to Literature in English, ed. Virginia Blain, Patricia Clements and Isobel Grundy, (London: Batsford, 1990), p. 272. ^ Veenendaal, Wouter (January 1, 2016). "Monarchy and democracy in small states: An ambiguous symbiosis". In Wolf, Sebastian (ed.). State Size Matters. Springer Fachmedien Wiesbaden. pp. 183–198. doi:10.1007/978-3-658-07725-9_9. ISBN 978-3-658-07724-2. ^ Examples are Oliver Cromwell and Richard Cromwell in the Commonwealth of England, Kim il-Sung and Kim Jong-il in North Korea, the Somoza family in Nicaragua, François Duvalier and Jean-Claude Duvalier in Haiti, and Hafez al-Assad and Bashar al-Assad in Syria. ^ Marlowe, Lara. "The Central African Republic, where Emperor Bokassa ruled with violence and greed". The Irish Times. Retrieved February 5, 2019. ^ Spence, Jonathan D. (1999) The Search for Modern China, W.W. Norton and Company. p. 274. ISBN 0-393-97351-4. ^ Murphy, Michael Dean. "A Kinship Glossary: Symbols, Terms, and Concepts". Retrieved October 5, 2006. ^ "Overturning Centuries of Royal Rules" (2011-10-28). BBC.com. Retrieved 2018-11-02. ^ Chara, Jihan (October 1, 2018). "Saudi Arabia: A prince's revolution". European View. 17 (2): 227–234. doi:10.1177/1781685818803525. ISSN 1781-6858. ^ Sheridan, Michael (September 16, 2007). "A tale of two dictatorships: The links between North Korea and Syria". The Times. London. Retrieved April 9, 2010. "Monarchy" . Encyclopædia Britannica (11th ed.). 1911.